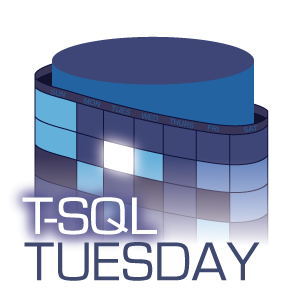 For this month’s T-SQL Tuesday, Koen Verbeeck asks us to write about how changes in technology affect our careers, especially with respect to cloud-based services eliminating the need for in-house DBAs. I was at the SQL Saturday Madison after-party this past weekend chatting about just this subject with Seth Bauer and Leonard Murphy. Tim Plas had just left; he’d given a talk on SQL Server Databases in the Clouds earlier in the day and I’d attended Drew Furgiuele’s PowerShell session. Together we concluded that cloud services and automation were likely to tamp down the market for traditional DBAs, yet there seemed to be growing demand for BI professionals. This makes sense. In business, you don’t want to be viewed as a cost center. You want to be on the revenue side of the equation. Whether IT is a competitive advantage or just plumbing depends on how it’s being used. If you’re just keeping the lights on, then you may be as critically important as the electricity itself, but you’re a commodity which can be replaced with a cheaper option. On the other hand, if you are providing insight which directs the company to profits, or if you are developing features which grow market share, your value is obvious. So if you’re on the administration side of IT, you’re naturally more vulnerable in the eyes of the company. You make things possible, but you don’t actually do the things. You have to bring something unique to the table so that you can’t be as easily replaced with a service. Get to know your users– not just developers but business folks. Find out how to make systems which empower them. Become part of the process. Don’t wait to be handed some specs. If they can package up their requirements and toss them over the wall, they don’t need you to be the one catching it. Anybody will do. #SQLSatMadison: @Pittfurg on #PowerShell "We're automating you out of a job. We're freeing you up to do the stuff you want to do." When working with the business on automation capabilities, I often ask whether any human judgment is involved in their task. If they are merely applying established rules, then they are executing an algorithm and it should be automated. If you are following a rote process of database care-taking, you are ripe to be mechanized. You should be automating yourself out of a job if any of your job can be automated, because if you don’t somebody else will. Do unique things. Get involved in your business. Become part of your technical community. Interact. Be human. Learn. Robots can’t… much… yet. This entry was posted in Tech Community and tagged #tsql2sday on 2017/04/11 by Riley Major.